A fascinating trip exploring the Clear Lake shoreline, around the infamous Soda Bay hot springs, looping back along Dorn Bay, and a calm paddle down Kelsey Creek. Beautiful views of Mount Konocti and the surrounding ridgelines. This route may be taken year-round. Note that in late summer and fall, intense sun, low water levels, and patches of algae and invasive weeds near the shoreline can impact paddling. A great trip for watching waterfowl and other wildlife, particularly in the winter and spring. 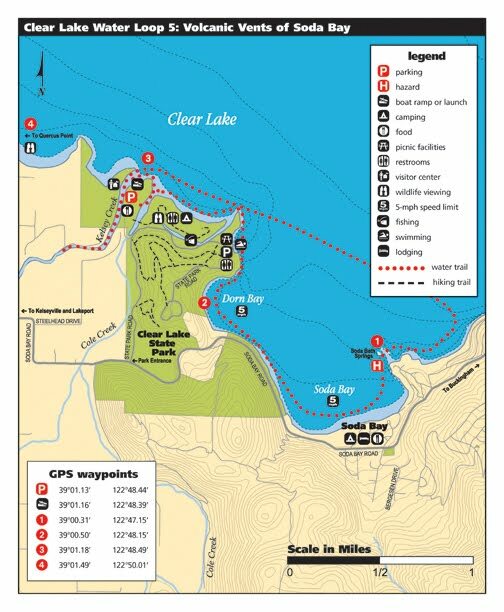 To access the trail, park (P) and launch from the boat ramp located within Clear Lake State Park (nominal day-use fee required). Hugely popular, Clear Lake State Park was established in the 1940s with a gift of 300 acres from Fred and Nellie Dorn. Today, the park has grown to span 11,600 feet of shoreline. From the ramp, head to the mouth of Cole Creek. Turn east and head toward Mount Konocti, a dormant multi-peaked volcano towering above Clear Lake. As you paddle, the water opens up; you are entering Soda Bay. According to Pomo legend, a beautiful maiden living on Mount Konocti created Soda Bay with tears shed over the deaths of her feuding father and lover. Geologists believe Soda Bay was formed by violent volcanic events that created a circular crater – called a “maar” – when magma came in contact with lake water. Today, Soda Bay still bubbles with volcanic gases of carbonated water that rise from the bottom of the lake, making the surface look as if it were boiling. The larger vent holes – some reportedly more than 100 feet deep – serve as nursery colonies for millions of juvenile catfish, attracted by plentiful food and protection inside the caves. Head directly across the bay, and two small islands come into view – you are at the Soda Bath Springs (1). Cement walls are all that is left of the Soda Bay resort once connected to the baths via a walkway; both were destroyed by fire in 1940. But during the early 1900s, health-seekers were drawn to local hot springs resorts, which promised to cure anything from rheumatism to obesity. Circle around the islands and you will see large bubbling carbon dioxide baths – warning signs herald the dangers of getting too close. In the past, asphyxiation deaths were caused when bathers built up the walls to increase the spa effect. This caused increased gas—and the shortage of oxygen. Today, the area is managed by the Bureau of Land Management. The walls have been removed, reducing the build-up of carbon dioxide near the water’s surface. Paddlers should respect the signs and keep a safe distance. lake and streams. Numerous large boulders dot the shoreline – these are great spots to pull over to rest or have a picnic. Continue past Cole Creek along the tule reeds—be on the lookout for a pair of resident osprey that can be seen catching fish. Turn in to Kelsey Creek (3), one of the main tributaries of the Big Valley watershed. Kelsey Creek is also important as one of the few spawning runs for Lake County’s own indigenous fish species, the Clear Lake hitch. Once so abundant that millions would clog the lake’s feeder streams each spring, today the population has diminished and is now recognized as a “species of special concern.” March and April are the best months to view Clear Lake hitch as thousands splash their way upstream, attracting a wide array of hungry wildlife during their spring run. During the winter and spring months of high water levels, it is possible to paddle up to the Kelsey bridge. During low-water months, the water becomes shallow and stagnant, and paddlers are forced to turn back. For an additional 3-mile round-trip paddle, head west hugging the shoreline up to Quercus Point (4). The marshy tule reeds provide nesting areas for Clark’s and Western Grebes, while treetops are great perches for numerous cormorants. Otherwise, paddle back to Cole Creek and the park boat ramp. Be sure to stop in to the Visitor’s Center and see the varied displays of birds, mammals, and Native American cultural exhibits. Alternate launch point: This trail loop also may be accessed from the swim beach within Clear Lake State Park instead of the boat ramp. Please note: There is a small day-use fee to access the park if you are not camping. Kayak and canoe rentals are available at the store near the launch during the summer months.